Two decades after the events that unfolded on the streets of Los Angeles on April 29, 1992, academics, journalists, and artists continue to try to make sense of what occurred then and what kind of impact they have had to this day. “Los Angeles Since 1992” explores what issues and questions have emerged, with attention to Asian American, African American, and Latino communities that inhabit the city together. 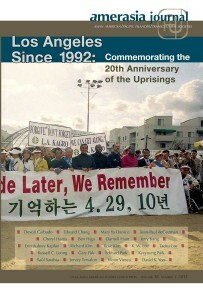 Edited by David K. Yoo, director of the UCLA Asian American Studies Center, and Darnell Hunt, director of the UCLA Ralph J. Bunche Center for African American Studies, the special issue revisits how Sa-I-Gu (4-2-9 in Korean) was experienced from a diverse set of perspectives, as well as how its aftereffects are felt even now. • A roundtable on Sa-I-Gu and its legacy, featuring members of the influential Critical Race Studies Program at the UCLA School of Law: Devon Carbado, Cheryl Harris, Jerry Kang, and Saúl Sarabia. • Commentaries from leading academic, community, and cultural voices: Edward Chang, Mary Yu Danico, Erin Aubry Kaplan, Taeku Lee, Russell Leong, Edward Park, Jervey Tervalon. • Journalistic accounts that cast a much-needed critical eye on mass media accounts of the uprisings by the dean of Korean American journalism, K.W. Lee, one-time Los Angeles Times reporter Rose Kim, and photojournalist Ben Higa. • New research that uncovers lesser-known points of view on the uprisings and Koreatown by Kyeyoung Park and Victor Viesca. • A review of literature and cultural works on the uprisings by Jean-Paul deGuzman, and book reviews by Gary Pak and Richard Kim. Copies of the issue can be obtained by ordering via phone, email, or mail. This issue of Amerasia Journal costs $15 plus shipping and handling and applicable sales tax. Contact the UCLA AASC Press for more detailed ordering information. UCLA Asian American Studies Center Press, 3230 Campbell Hall, Los Angeles, CA 90095-1546; (310) 825-2968; [email protected]; www.amerasiajournal.org/blog/ or www.facebook.com/AmerasiaJournal. Amerasia Journal is published three times a year (winter, spring, and fall). Annual subscriptions are $99.99 for individuals and $445 for libraries and other institutions. The subscription price includes access to the Amerasia Journal online database, with full-text versions of published issues dating back to 1971. Instructors interested in using “Los Angeles Since 1992” or other issues of Amerasia Journal in the classroom should contact the above email address to request a review copy.